What foods are best used to prep? There are some foods we choose to prepare in advance and some that we simply don’t. If you think some foods get soggy and taste awful after a couple days, you’re right, they do. Because we’ve chosen to live a life of eating “clean” often, we will mention foods we normally use in our home, plus others. The Main reason we use these is because they’re versatile They also store well in the fridge when put in a sealed container. This is a famous question and one that I really want you to understand so that food does not go to waste. The schedule shows a four day lunch prep. Four days where the lunch is needed, and 2 days where other events are taking place and food is not needed. So the point is to look at your week ahead and prep accordingly. If you don’t check your week, you have the possibility of having food go to waste (so learn from our past experiences). How long can I store food in the fridge? Can I freeze certain foods? Ground beef. USDA suggests you cook or freeze your ground beef within 2 days of purchase. If refrigerated, keep below 40 degrees Fahrenheit (4.4 degrees Celsius) or below and use within 2 days. Ground beef is safe indefinitely if kept frozen, but will lose quality over time. Best to use within 4 months. Cooked ground beef can be stored in the refrigerator for 3-4 days. Cooked ground beef can be kept frozen for up to 4 months. Poultry. Raw poultry should be stored in the fridge no longer than 2 days. Cooked poultry can be stored in the fridge 3 to 4 days. Seafood. Refrigerate no longer than 2 days. Cooked seafood can be stored in the fridge no longer than 3 to 4 days. Sweet potato. If cooked, can be stored in the fridge for no more than 3 days. Try removing skin before storing to preserve freshness. Quinoa. Can be stored in the fridge, cooked, for 3-4 days if put into a sealed container. Same applies to brown rice and wild rice. Asparagus, Green beans, Zucchini, Brussels sprouts, and Eggplant. Can be stored in the fridge, cooked, for up to 3-4 days maximum. Absolutely. 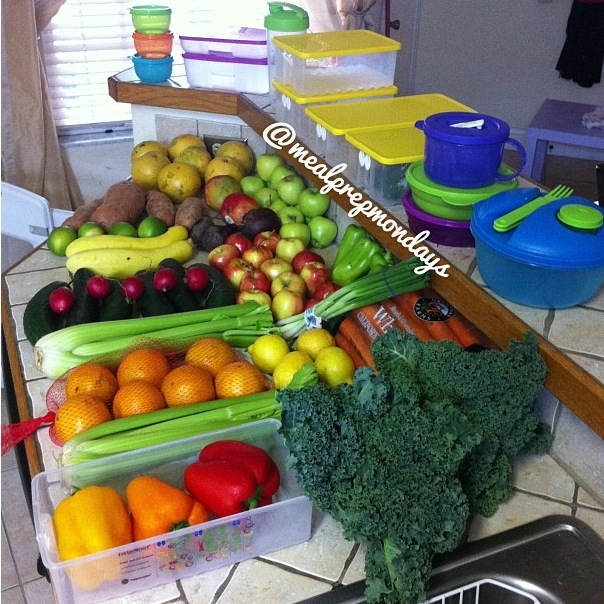 The better you are prepared for meals and snacks, the better your odds at staying within your plan. Snacks are best prepped in small sandwich or snack bags if available. For example, we helped someone with their meal plan, they asked if they can have dark chocolate covered pomegranate as a snack. We checked the calories, and were able to work in 10 small pieces of this into her meal plan due to her sweet tooth. For some trainers and nutritionists, they’d probably think we’re crazy for doing this but you know what, its better to be up front about your weaknesses than to do it behind the scenes then wonder why no progress is being made. Get it under control. Plan ahead. This is an area that you’ll need to look into and get professional advice from. No, Google cannot answer everything for you, sorry. This area is so important, that if not taken seriously can lead you to a state of malnutrition and cause more bad than good. @Mealprepmondays does offer custom meal plans but we only accept enough clients where we do not get overwhelmed by clients. We believe in giving the time and attention to the existing clients and making sure they achieve their goals. Once we feel we can accept and fit in another client, we will notify you. For more questions regarding these plans, please feel free to email us at mealprepmondays@gmail.com. What’s the best way to weigh my food? Look into purchasing a digital food scale. This will be the simplest most convenient way to weigh your portions. Also consider using a glass or stainless steel base to avoid trapping bacteria. Plus, it’s easier to clean. FridgeSmart Containers – These containers help store your fruits and vegetables 2-3 times longer than simply leaving in your fridge as is. We personally own 9 of them. They come in 4-5 sizes. Not to mention it helps you save money by not having to throw out bad produce. Freezer Mates – These help eliminate freezer bags. They help store meats and veggies in the freezer by stacking versus simply throwing a frozen bag of chicken breast. The design helps keep it organized and stacked in the freezer and helps for faster, more efficient, freezing and thawing. CrystalWave Containers – Reheatable Rectangulars. Your ideal, on-the-go meal solution. Stackable, modular shape maximizes refrigerator space. Containers nest for compact storage and feature textured, scratch-resistant bottoms. Best way to store your prepped meals. Plus many more located on our site www.my2.tupperware.com/mealprepmondays We listed the four above because that’s what is used mostly in our home. Hopefully this helps you get started in meal prepping. We really enjoy the #mealprepmondays community within Instagram, Twitter and Facebook and we look forward to sharing more information with you as time goes on. We also look forward to updating this guide with more tips to help you in your journey. If you’re interested in creating a custom meal plan for yourself, give us a shout, we’d love to help. So who's ready to take their meal prepping seriously? Get some tips and suggestions on how to effectively prep your meals ahead of time. Fail to plan, plan to fail!